When I was pregnant with Natalie and a sweetly clueless mother-to-be, I registered for an all-wood highchair. It was a carefully researched decision, which is to say I based my choice solely on the fact that I grew up with a wooden highchair, and I figured anything good enough for my Mom when she started having babies in the 70s must be good enough for me. I received the requested wooden highchair at one of my showers -- I had three, the advantage of being the daughter of a senior pastor who is dearly loved -- and initially, I was very pleased. It looked so sturdy sitting in the corner of my kitchen. So homey. So maternal. I was sure it would be a fixture of my children's lives for years to come. 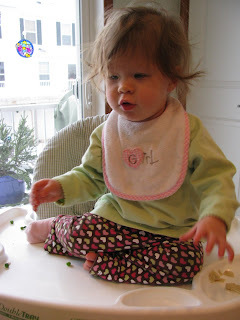 Then Natalie got old enough to actually sit in the highchair, and its downsides were suddenly revealed. 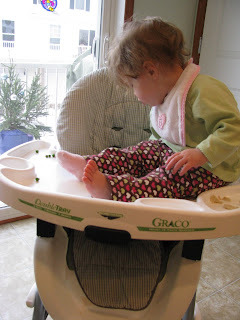 Turns out, it helps if the highchair tray is actually close enough to the child so they can reach the food. This one was apparently built for Hagrid-sized babies, as it was a good 8 inches away from the back of chair even when it was pulled all the way in. Natalie, who was so petite she wore 6-9 month clothes at her one-year birthday celebration, would pull food off the tray and keep it in her lap while she was eating, as if she she needed a halfway point on the trek to her mouth. The seat had so much room (and the buckle was so flimsy), she could easily stand up in the chair and do a little dance routine. But I couldn't picture any other highchair in my kitchen, so we soldiered on. Connor came along, and by 10 months, he was having his own issue with the highchair. Mainly, he viewed it as a prison cell. I have no clue how he got that idea. So he started plotting his escape. Which explains how I walked into the kitchen one day and found this. That was the end of the wooden highchair. One eBay transaction later, we were the proud owners of a modern, plastic highchair that was much better at containment. That is the highchair Teyla inherited a few months ago. Its in decent enough shape, although the cloth liner has seen better days, and the vinyl pad underneath is cracking and rotting. But it worked. We were golden. Problem is, I underestimated Teyla. (I have a feeling I'm going to be saying that for the next 20 years.) That girl could put Houdini to shame. She refuses to sit in it, preferring to eat while she stands, and since it didn't come with seat belts or harnesses of any kind, I have no way to force her little rear end down. Whch is why most meals at our house end like this. So I'm done. I'm ready for a new highchair, one that actually confines my child at mealtime. But since I haven't really been in a Babies R Us since that fateful day I registered for the wooden highchair seven years ago, I don't have a clue where to start. I just know I want a highchair that works well for toddlers and that is easy to clean. The cloth liner has pushed my OCD buttons one too many times. What recommendations have you got for me? Who has a highchair they love? *Updated to add: I love the suggestions about a booster chair. Unfortunately, the only table that will fit in our kitchen right now is a small, round, table for four (known in the restaurant biz as a four-top). So I don't have room for Teyla to sit with us at the table, nor do I have a fifth chair upon which to attach a convertible seat, which is why I'm looking to invest in a separate highchair. We do have a bigger table with six chairs, but it's in the carpeted dining room right now, which is obviously not a kid-friendly option. On a side-note, you could keep praying for our old house to sell so we could get into a bigger place that would enable us to eat together as a family before the kids are teenagers. Amen. Our daughter has delayed fine motor skills, Kelly, so I don't know how Houdini proof the buckles are, but we really adore our Stokke Tripp Trapp chair. Some people don't like the fact that it doesn't have a tray (it pulls up to the table), but we did find that our daughter really enjoyed being "with us" during meals. She still uses it at nearly five. Kelly - let me assure you that AJ is Teyla's long lost soul sister and never ceases to amaze me with her wiggling out skills. Having said that, this is the chair you need!! Ours is a different pattern and I sure didn't pay $90 for it in store (maybe it was on sale?) but ohmygosh. Best high chair ever. Totally wipeable but CUTE chair cover, one handed tray removal, cute little snack tray underneath the main tray. Best part? the harness!!! When we first started sitting her in it, I laughed at "who on earth needs a five point harness on a high chair?!?!" Months later, I found out. Me, that's who. We don't use the top straps now, but the waist straps are more than enough to keep her strong-willed self sitting down. Seriously, this is the chair for you. Chicco all the way. We have it and love it! It's not hard for me to keep it clean. That seems like a common complaint- and I don't know if we have an exceptionally clean child (I think not, since he throws up in his highchair regularly...) :) Anyways- I don't know if these other parents expectation is that high chairs clean themselves or what- but we have it and love it and highly recommend it! He was self-feeding anyway and loved being a part of the family at the table. It was cheap and super easy to clean. It also easily kept him contained as we put the tray on so tight he could not wiggle around. IF I had to pick my fantasy high chair it would be the peg perego primo pappa high chair. 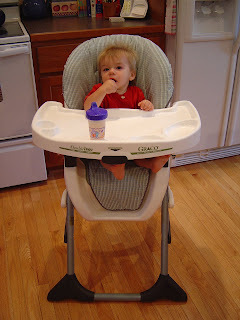 I was going to rave about how much we love our Eddie Bauer wooden high chair (with an adjustable tray and great safety harness), but then I read the other comments and realized I was getting convinced--one might even say jumping on board--of the benefits of a booster seat. *sigh* I guess Eddie Bauer won't be hiring me for endorsements any time soon. Two words - booster seat. Here's mine Well, it's Zesty's, technically. We got it at Target for $30 something, and we've taken it everywhere. We have the high chair/booster seat thing (Fisher Price Space Saver High Chair - Target $50). It doesn't fit under our table, either, so I put it on a sturdy chair and use it as a high chair in the other part of the kitchen. I love it! It doesn't move around, the tray can be locked in place/taken off with one hand, easy to clean, and the harness is at the waist. It comes with a shoulder harness but we don't use it, my 11 mo. old would hate that. Plus, it's a neutral color that looks good in pics. Hope that helps. We have a first years booster/high chair that attaches to our kitchen chair. The tray can be attached very snugly or loosely (it has three levels) and it has waist buckles too. It is all molded plastic (read: can be totally sterilized). It also pulls up to our kitchen table without the tray attached. My just turned 3 year old uses it as the booster and loves it. Good luck on your search! I have the same Chicco as Emily, and we like it. However, it's very large and Jordan can wiggle out of the straps if he works really hard at it which he does. After reading the comments, I think I'm going to buy a booster seat. If you don't have any luck with a new highchair get a booster seat and then hie thee to an office supply store. Buy a clear vinyl chairmat and use that to protect your carpet. IF you do want to try the carpeted area for all 5 of you, may I suggest this. I love those mats with an ever-lasting love. Also, don't give up on the idea of a booster, even if she doesn't fit at the table. If you have a spare chair just put her and her booster with the tray on in the spot you would have put the high chair. Seems like you need to go all Biblical and get a table about a foot off the floor and recline as you eat! Never a dull moment, huh?! I have a fisher price seat and loved it because they could do the buckles themselves ;) Not good if they are crawling on top of the tray though. 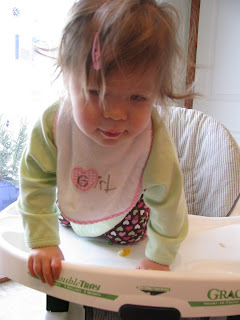 I also have the stokke Tripp Trapp chair and she wouldn't be able to undo those buckles quite yet. They are fairly difficult but it does have to be pulled up to the table. We have a little round 4 seater table and still pull it up but a high chair might be better for you. Good luck!! I would opt for just sitting on the floor. Spread out a blanket and have a picnic everyday! lol! I love that you take pictures of them in their precarious climbing poses! I have pictures very similar to those! Only my guys are hanging off of the changing table, and dressers. I also have a table for 4. And need a bigger house so we can have a bigger table (my family is now 6 people!). We use plastic booster seats strapped to metal folding chairs. It's not pretty but it gets the job done for now. Depending on which one you buy it comes with a tray. And they are much cheaper than a high chair! I don't have the space in my eat-in-kitchen for a real high chair. This works for us now. We've loved our Fisher Price Healthy Deluxe High Chair. It has been going strong for four years with hardly a break and it still looks decent. The pad is machine washable which I love. The harness goes over the shoulders and the waste, but it is easy enough to leave the shoulder part off and just clip the child at the waste. My two oldest are quite adventurous and neither of them managed to climb out of their high chairs.